What learning options are available to me, and what are the benefits of each? What is the difference between virtual, in-class and distance learning? Students tell us that Virtual Learning offers flexibility for those who like live instruction, but don’t have the time to physically attend class. As a student, you log in to the virtual learning platform at a specified time on a specified day, just like a live class. You can hear the instructor’s voice and see their computer screen (usually a PowerPoint presentation) on your own computer. You’ll also have the opportunity to ask questions and contribute to the discussion by typing in a class chat room, which appears along the side of your screen beside the instructor’s presentation. Some students choose to register in virtual classes in other provinces because of time zone differences—the time zone differences allow them to take their class earlier or later than the classes that are available in their own province. This allows for an excellent way to manage personal responsibilities. Students may also register in virtual classes in other provinces because the class they wish to take isn't offered at their local Institute or Chapter in the semester they wish to take it. What students like most about In-Class Learning is the physical presence of a live classroom environment. As a student, you would show up to class at a given time on a given day each week. Students tell us that in-class learning provides them with great networking opportunities with other industry professionals, and just like virtual learning, it gives students the opportunity to ask your instructor questions and interact with other students. You can register for in-class learning through your local Institute or Chapter; if you live close to another institute or chapter location, you are also welcome to register for in-class learning there. Choose this method if live, highly-interactive methods best suit your learning preference! Distance Learning, which you might have heard colleagues refer to as “independent study”, is a work-at-your-own-pace method of taking your CIP courses. Students with time restraints or a preference for independent learning favour this method of delivery. In distance learning courses, your entire grade is based on your final exam, but you have the option to submit test papers for bonus marks. Distance learning is ideal if you have an irregular schedule or if you prefer independent study. For some distance learning courses you’ll also have access to an online tutorial. How do I transfer classes or courses? Occasionally, your schedule might change, or personal commitments will interfere with your ability to complete a course. Students tell us they appreciate how accessible their local Institute or Chapter Manager, or a member of our Member Services team can be in helping to identify options on how to transfer into another class or course. CIP students are busy, and we understand that. Learn more about transferring in the rules and regulations section of our website. We know that situations may sometimes arise whereby you are unable to continue with completion of the course, whether it is for work-related, health or other personal reasons. You may not know that there is a straightforward withdrawal process available to you. For students enrolled in the Distance Learning program, withdrawals are granted free of charge, in the case of a professional, health or a medical situation, with supporting documentation. For all other reasons, there is a $50 withdrawal fee. You will find specific withdrawal deadlines in your local Institute or Chapter’s withdrawal policy. For students enrolled in the in-class or in the online option, please contact the local Institute or Chapter through which you are completing the course to confirm the cancellation fee and process. For any other questions, regarding the withdrawal process, please contact Member Services at 1-866-362-8585. We are here to listen and support you in your completion of the program. What if I can't make one of my evening or virtual classes? Attending every single class might not always work out because of scheduling issues, or personal or work conflicts – we understand that sometimes, life gets in the way! Instructors tell us they appreciate being advised of any conflicts in advance so that the student and instructor can work out a way for the student to ensure he or she is able to keep up with the course material. How quickly will I receive my test papers back? Distance Learning students writing the optional test papers are often anxious to see their results. You might be relieved to know that results are returned to you at the email address you submitted on the form approximately 2-3 weeks prior to the exam. Why do I have to pay tuition for Distance Learning? Can I just study and write the exam? It may be helpful to know that the tuition for Distance Learning also gives you access to resources such as test papers that may be submitted for supplementary marks, access to a tutor to ask questions; and access to an online tutorial and a student resource guide (SRG) for mandatory and applied professional courses. These resources will enhance your learning and improve your chances for success in your courses. Do I need to have work experience in the industry to graduate as a CIP? The CIP designation is highly valued by the industry as it demonstrates both a high standard of learning as well as real-life experience from industry employment. Graduates tell us they benefit from the requirement to have fulfilled at least one year of full-time employment in the general insurance, life insurance, or related financial services industries. This full-time working experience means that they graduate with both practical and theoretical knowledge needed to be able to provide a high standard of service in their roles—immediately. If you are unsure whether you meet this experience requirement, you may request clarification by submitting a detailed work history to the Registrar. Does part time or co-op work in insurance qualify as the year of experience needed to graduate as a CIP? No. In order to receive the complete theoretical and practical knowledge required for graduation from the CIP program, students must complete at least one year of full-time industry employment. Graduates have told us that while the experience gained from part time or co-op experience is valuable, it does not provide the depth or breadth of experience that is gained from full-time employment of at least one year. How does the CIP apply to my insurance career? To find out more about how the CIP program can apply to your career, we encourage you to check out the Institute’s mycareer resources. Within these resources, you will find career maps relating to 10 core operational roles in insurance, as well as people and technical management. The maps are intended to provide you with a point of reference to determine where you are now in your insurance career, set both short and longer term career goals, and identify concrete steps you can take to help you get there. What is the value of the CIP designation? Things change rapidly within the insurance industry and you need to move with the trends. CIP graduates tell us that insurance education elevates their knowledge and allows them to share that knowledge with the people they serve, whether it be clients, staff, or other colleagues in the industry. A CIP designation will help you advance throughout your career and provide you with a foundation to enrich your further studies and practical experience. It provides a solid understanding of how insurance operates and how you can be an effective insurance professional. Graduates tell us they gain recognition in their workplaces and in the industry because their designation shows they are dedicated to their career. Leaders understand and recognize the time commitment needed to pursue the CIP designation and as a student in this program, you have already achieved a competitive advantage in the industry. It’s not just about the letters; the CIP designation is the educational standard in the p&c industry and more employers are looking to see those credentials for hiring and promotion. The program not only provides the theoretical know-how, but real world examples that help employees find solutions to build better client relationships. CIP graduates know what it takes to succeed in this industry, and they are able to build a strong and vast network with other graduates. But that's not all. Together with the Conference Board of Canada, we interviewed more than 1,000 p&c insurance stakeholders to assess the effectiveness and value of the CIP designation. Click on the pictures below for a summary, or you can find the entire report here. When you successfully complete your final exam in the CIP program, you may be anxious to know when you can begin using your CIP designation. Your grades are posted about five weeks after you write your final exam. You should receive a letter from the CEO of the Insurance Institute congratulating you on your achievement approximately one to two weeks after successfully completing your final course. Will this designation help me get a promotion? 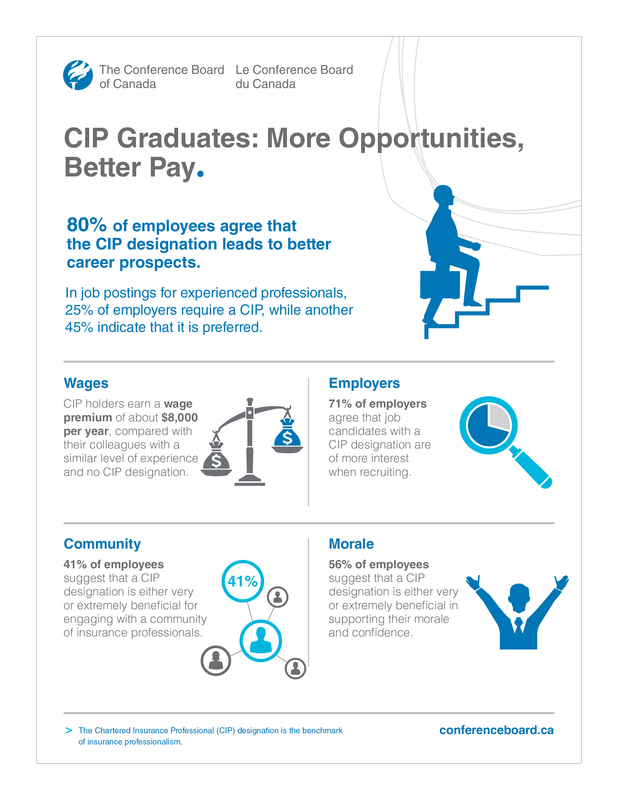 Click on the below pictures to learn more about how both you and your employer will benefit from your CIP. How will the CIP help me do my job better? Students have confirmed they use the broad base of knowledge they gain from the CIP program to tackle the everyday tasks they are presented with on the job. As you learn different aspects of insurance through the CIP courses, you will develop a broader view of the industry. Students have the flexibility to choose from the three areas of concentration—claims, underwriting, and broker—or focus on one or two career paths. I have completed a college diploma. Why do I need a CIP designation? 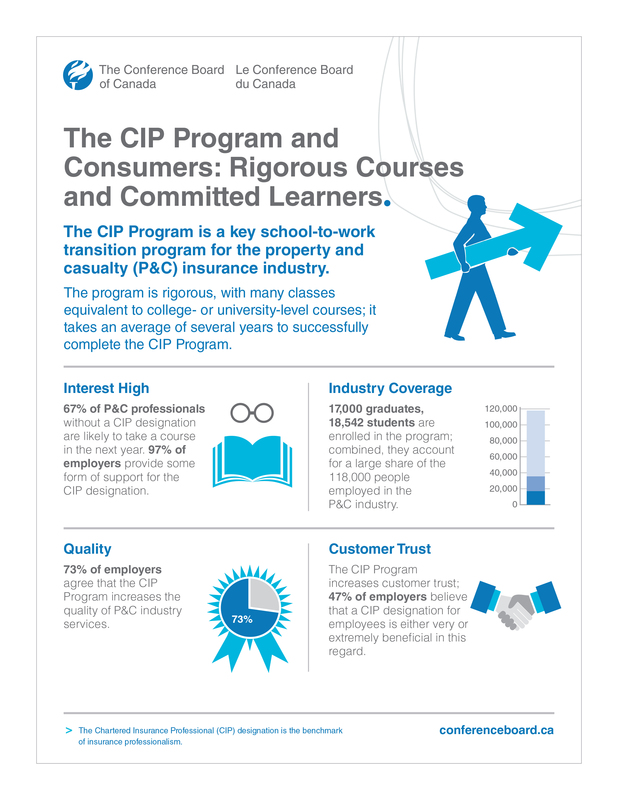 Though your college diploma has given you a strong foundation for working in the insurance sector, the CIP designation is an industry standard which identifies you as having the technical knowledge and skills required to succeed in the industry—no matter where you are in the province, country or even the world! 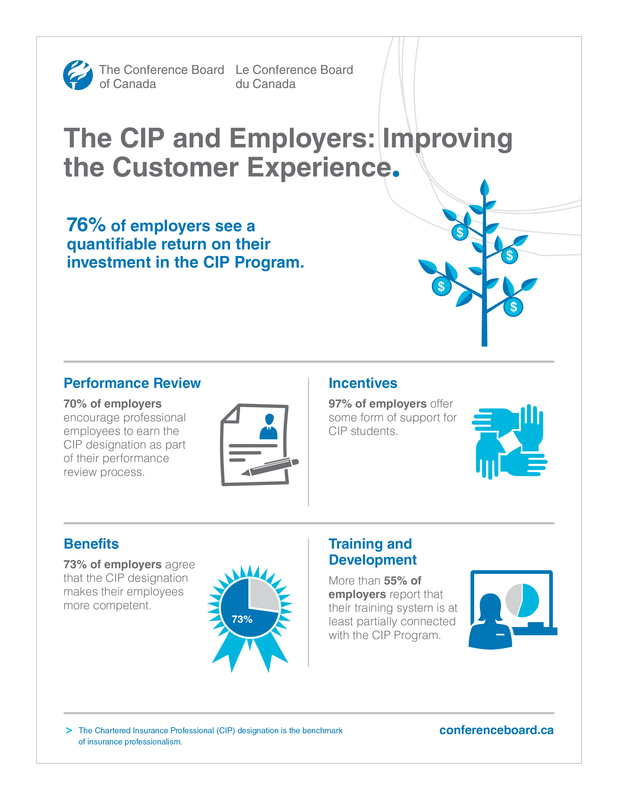 Consumers and employers can trust that the CIP program remains the benchmark of professionalism for the p&c industry. Industry employers are aware of the rigor of both the college programs and the CIP designation—meaning they also recognize your ability to focus and multi-task. Students with a CIP designation have found it helps accelerate their careers, offers advanced standing for higher-level broker and independent adjuster licenses (in some provinces), and provides them with advanced learning opportunities and benefits through the CIP Society. 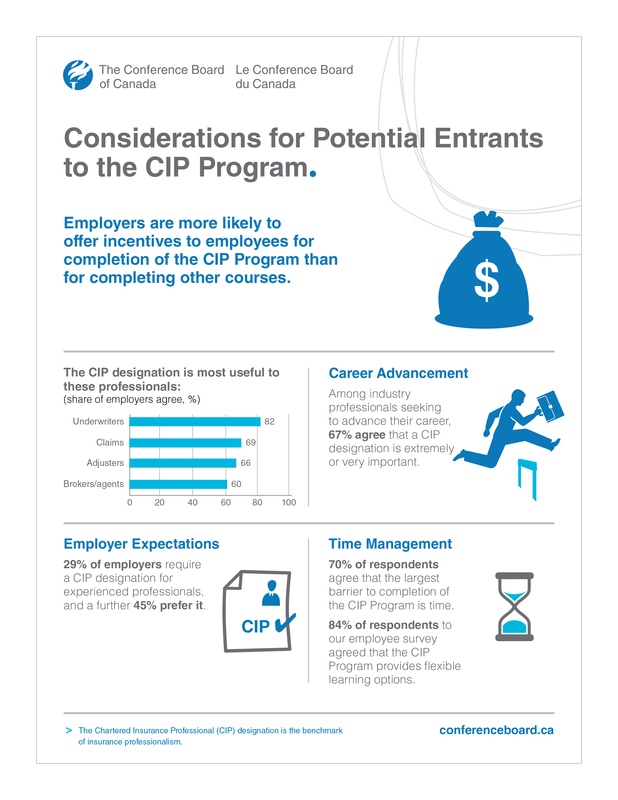 Why should insurance industry employers support the CIP program/designation? You may not know that the Insurance Institute and our designation programs arose from a need expressed by property and casualty industry employers, and it is because of this that the employer support of the CIP designation has been common practice. Employers in the industry tell us that they understand that the industry and its business requirements are ever changing. Investing in the professional learning of their workforce is one of the ways in which they can distinguish themselves amongst others in the insurance marketplace. By supporting the CIP programs/designation, industry employers tell us they build a climate of engagement within their organizations that embraces continuous learning and professional development. This investment in human capital can not only help attract and retain talented, creative and motivated people, but also helps foster credibility among consumers and business partners. How can I educate my employer on the value of this designation? When approaching employers, students have told us that they found it helpful to introduce the structure and learning objectives of the CIP program. We encourage you to visit www.BeAssured.ca and show your employer the Conference Board of Canada report on the value of the CIP. This report is the result of the interviews of more than 1,000 p&c insurance stakeholders to assess the effectiveness and value of the CIP designation. In addition, you can see what both current CIP students and graduates have to say about the Institute and the CIP in our National Education Week video. Students are welcome to put their employer in touch with their local Institute or Chapter Manager for more information on the Institute’s programs and to obtain posters and postcards to distribute to staff members. We would love to help! Will I be recognized by my employer for my efforts in the CIP program? We've seen employers celebrate their graduates in a number of different ways, including attending Convocation ceremonies, gatherings in their offices, new business cards, recognition on the company's internal website, and sometimes financial rewards - along with much, much more. If your employer plans to or already conducts employee celebrations of graduates, please get in touch and let us know. We would be delighted to profile the event in local institute and chapter newsletters. What qualifications do program instructors have? Did you know that all instructors are required to hold a CIP/FCIP designation and have teaching, coaching and/or training experience, as well as one to two years of industry experience related to the course they are teaching? In fact, the majority of CIP instructors well surpass these criteria, including adult teaching qualifications, other industry designations, and have many years of experience and knowledge to draw upon. Students find instructors' real life experience immensely valuable because they can bring the content to life and share how it is used in the field. At the Insurance Institute, we are lucky to have a balance of experienced instructors and newer, more recent grads working together to provide the level of instruction needed for a positive and successful learning experience. What is the Insurance Institute doing to improve/enhance the program on a continuing basis? Students tell us that it helps to understand how the textbooks and course materials are written and updated. A team of learning and development professionals compiles the texts using technical material provided by curriculum advisory committees. These curriculum advisory committees lend insight into current industry trends and best practices. There are currently a number of projects underway to update and revise our course materials, and updates are prioritized by volume of students enrolled in the course. The Institute constantly reviews and revises materials in order to stay as up-to-date as possible. It is important to be sure you are using the most recent version of any text in the program; a list of current text book years and any revisions or addendums can be found here.